Neil Haskell, a contestant on So You Think You Can Dance, is seen shirtless here with a hint of his Fruit of the Loom boxerbriefs or briefs showing above his shorts. What is with celebrities and Fruit of the Loom? Thanks to Just Jared for this photo. 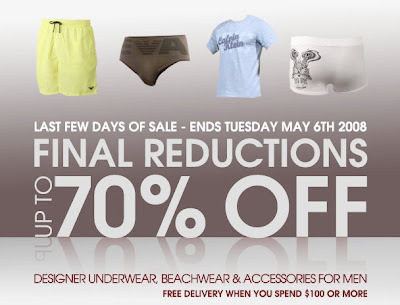 Mensuas is offering 10% off Joe Snyder through the end of the month with coupon code js08. Items on sale include this capri bikini (shown). Feel the power of blue with the new power blue color at Cocksox. Also (sorry for the late notice) in honor of the new color and the new tank take 10% off the all Cocksox products until midnight May 25 with coupon code 'power'. Sorry for the short notice, but for the remainder of today you can get 20% off all Gregg Homme, old and new alike, at Wyzman. Check it! AussieBum just released new Shine swimwear. These things will be sure to turn heads your way on the beach this summer. They come in blue, silver, bronze, and camo. 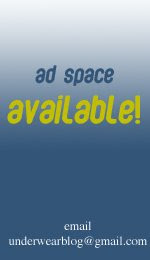 Check out the promo video below. 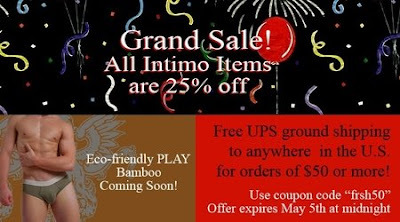 Intimo is having a grand sale! All Intimo is 25% off! And if you order $50 or more you'll get free shipping with coupon code frsh50. You may remember back in February aussieBum came out with special edition Valentine's boxers with built in booster jock enhancement technology. As I suggested, they've extended this new innovation in boxers to everyday boxers called Pillowbiter (if you don't get the name's reference look it up on Urban Dictionary). These new boxers are silky and small. They are low-rise with short legs, so there is very little covering. This is a good innovation as the problem that I often have with boxer shorts is there is just too much material that bunches up inside pants. The pillowbiter range comes in black, navy, and royal blue and is available for $28 USD from aussieBum.